All Web addresses mentioned were functional as of 2-12-16. From the Cumberland Gap to the Atlantic Ocean, this is Virginia Water Radio for the week of February 15, 2016. This week, we feature another mystery sound. Have a listen for about 10 seconds, and see if you can guess this cold-season member of Virginia’s feathered fauna. And here’s a hint: there’s no foolin’ about the glittery color of this bird’s eye. If you guessed the Common Goldeneye, you’re right! In summer, this medium-sized duck breeds around forested waters and wetlands in Alaska, other northern states, and Canada. But from mid-fall to early spring, it can be found in Virginia around the Chesapeake Bay, on other coastal waters, and on inland lakes and rivers. While the name goldeneye comes from its distinctive yellow or amber-colored eyes, the whistling sound you heard—of the bird’s wings during rapid flight—has led to other common names, like whistle-duck, whistle-wing, and brass-eyed whistler. Another distinguishing feature of the Common Goldeneye—one missed, unfortunately, in Virginia and the bird’s other non-breeding areas—is the males’ unusual and complicated courtship behavior, including displays with such colorful names as fast head-throw-kick. Common Goldeneyes are diving ducks that feed underwater, consuming a variety of molluscs, crustaceans, insects, fish, other animals, and vegetation; in turn, they’re prey for raccoons, hawks, owls, eagles, and some other birds. Along with several other species—such as Buffleheads and scoters—Common Goldeneyes are part of a subfamily of birds known as “sea ducks,” which collectively share the diving habit; migrate to coastal waters for winter; and play a prominent role in the waterfowl traditions of the Chesapeake region. Thanks to Lang Elliott for permission to use this week’s sounds, from the Stokes Field Guide to Bird Songs, and we close with another short listen to the whistling wingbeats of the Common Goldeneye. The sounds of the Common Goldeneye were taken from the Stokes Field Guide to Bird Songs-Eastern Region CD set, by Lang Elliott with Donald and Lillian Stokes (Time Warner Audio Books, copyright 1997), used with permission of Lang Elliott, whose work is available online at http://www.langelliott.com/ and the “Music of Nature” Web site, http://www.musicofnature.org/. Common Goldeneye male, photographed in California in the early 2000s. Photo by Gary Kramer, made available for public use by the U.S. Fish and Wildlife Service's National Digital Library, online at http://digitalmedia.fws.gov, accessed 2-11-16. 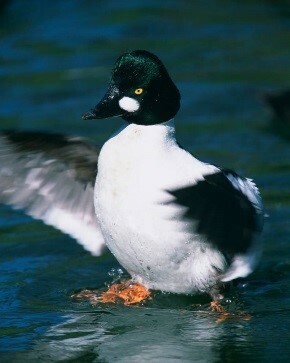 Chesapeake Bay Program, "Common Goldeneye," online at http://www.chesapeakebay.net/fieldguide/critter/common_goldeneye. Cornell [University] Lab of Ornithology, “All About Birds,” online at http://www.allaboutbirds.org. Cornell [University] Lab of Ornithology and American Ornithologists’ Union, “Birds of North America Online,” online at http://bna.birds.cornell.edu/bna (subscription required). Poseidon Waterfowl, “Sea Duck Hunting on the Chesapeake Bay,” online at http://www.marylandseaduckhunting.com/. Virginia Department of Game and Inland Fisheries, Fish and Wildlife Information Service, “Common Goldeneye,” online at http://vafwis.org/fwis/booklet.html?&bova=040067&Menu=_.Taxonomy&version=16842 (the link to search for other species is http://vafwis.org/fwis/?Title=VaFWIS+Species+Information). Outdoor Sportsmen Group, Wildfowl magazine, “10 Best Sea Duck Hunting Spots in the U.S.,” July 11, 2013, online at http://www.wildfowlmag.com/waterfowl/10-best-sea-duck-hunting-spots-in-the-u-s/. Virginia Society of Ornithology, a non-profit organization dedicated to the study, conservation, and enjoyment of birds in the Commonwealth; online at www.virginiabirds.net. E-bird Web site at http://ebird.org/content/ebird/, maintained by the Cornell Lab of Ornithology and the Audubon Society. Here you can find locations of species observations made by contributors, and you can sign up to contribute your own observations. All Water Radio episodes are listed by category at the Index link above (http://www.virginiawaterradio.org/p/index.html); see especially the “Birds” category. ES.8 - influences by geologic processes and the activities of humans on freshwater resources, including identification of groundwater and surface water systems in Virginia. WG.3 - how regional landscapes reflect the physical environment and the cultural characteristics of their inhabitants [for sea duck/waterfowl hunting tradition in the Chesapeake region].